For as far back as 3000 years ago, when the ancient Egyptians started using clay tablets to record transactions, people have been recording the exchange of good and services. This includes financial exchange between two parties, tracking goods and services going through a supply chain or documenting contractual agreements. Society’s acceleration of trade and commerce is moving into the digital age the methodology for recording transactions is becoming even more complex. The existing network platform is a series of inconsistent ledger systems, susceptible to errors, fraud and misinterpretation. Let’s take the diamond industry to demonstrate how it can benefit from the use of blockchain. The journey of a diamond as it travels from extraction in the mine to the end customer involves a complex landscape of manufacturing, financial, legal and commercial and regulatory practices. The current supply chains have to rely on a variety of intermediaries throughout the process from government officials to lawyers, accountants, banks and brokers. Each step of the process adds time and increases the final cost to the consumer. Additionally, diamond misrepresentation, fraud and smuggling impede governments from applying export taxes and this opens the door for consumers and retailers to purchase counterfeit or unethical stones. By using blockchain ledger technology in the diamond industry there is the potential to eliminate these vulnerabilities by replacing them with transparent transactions. The blockchain provides all parties involved in the business network with a secure and synchronized record of every transaction. No one individual has the ability to change a record. The blockchain digital ledger records every sequence of transactions from start to finish even if the process requires hundreds of steps in a supply chain or a single payment from an online purchase. As each transaction is completed, it’s put into a block and each block is connected to the one before. Then the groups of transactions are blocked together and a fingerprint of each block is added to the next, which in turn links into an irreversible digital chain. This is why the blockchain digital ledger is a perfect solution for maintaining indisputable records in the diamond industry. It becomes simple to track and trace diamonds throughout, their value added supply chain. Blockchain ledgers work with all sorts of transactions but some critical components make them excellent for a highly regulated industry, like diamonds. The blockchain is secure because the ledger is distributed to all the nodes on the network. This shared structure allows it to be tamper-proof because no individual person or entity holds ownership of the network. This decentralized system is ideal as a diamond cycles through its supply chain. Everyone involved in the process is given permission to have a copy of every record and piece of data. No transaction can be added to or deleted from the chain without all participants reaching consensus. This prevents any individual from adding to or altering the blockchain without it being permanently recorded. This makes it tamper proof and very secure and eliminates opportunities for error or fraud. A diamond blockchain ledger platform can document each diamond through a record of high resolution photos, certificates of authenticity, payments as well as, production details like cut, clarity, carat, color and serial numbers. So there is a complete auditable record throughout the production cycle. The diamond industry needs blockchain technology and it will radically transform how diamonds will be bought and sold in the future. 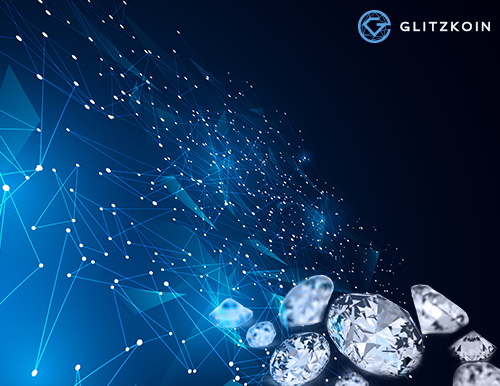 GLITZKOIN believes that blockchain technology will help modernize the diamond industry by making it more secure, transparent, allowing smoother access between diamond buyers and sellers. GLITZKOIN’s professional diamond management team has partnered with a strong technical team to develop a project that includes the building of a state of the art diamond trading platform using the Stellar based blockchain.